Wife and mother, Sarah Hartrum-Decareaux, shares her grieving process after losing husband and two children in new book. Grieving the loss of someone or something results in substantial physical, emotional and social impacts that leave many wondering how they will move forward in life. After suffering from the loss of her husband and two of her five children after a hiking accident in the Ozark Mountains of Missouri, Sarah Hartrum-Decareaux wrote the book “From Here to Heaven” to guide others through their own grief journey and let them know they are not alone. In this intimate story, Hartrum-Decareaux shares how she has relied on her faith in God in order to move forward in life and guide her children through their own grief process. 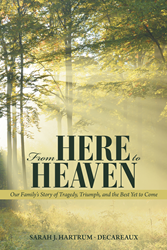 “This book is our family’s testimony of God’s provision as He sees my remaining children and me through the brutal grief process and toward renewed life,” Hartrum-Decareaux says. Sarah Hartrum-Decareaux is a former military wife who homeschooled her five children. Since suffering the loss of her husband and two children in January of 2013, Hartrum-Decareaux works as a substitute teacher, wrote “From Here to Heaven” and gives back to her community that surrounded her with support during her grieving process.